his historical plays have probably supplied many with their principal knowledge of the early annals of our country, from King Lear downwards; and we must not quarrel with the dramatic fate of Cordelia, although her real story was more prosperous, as we have, consequently, some of the most pathetic passages in the works of our immortal bard—that is, if such bard there ever was; for the overbearing mass of intellect, imagination, and beauty, presented to us under the name of Shakespeare, is such, that one almost considers the name a myth, and decides that, at least, the Seven Sages must have been engaged in its production. When his warlike avocations allowed him Henry the Fifth kept the feast with splendour; but his reign was nearly brought to a close at its outset, if we are to believe those historians who state that, when he was keeping the Christmas of 1413-14, at Eltham, there was a plot for seizing him and his three brothers, and the principal clergy, and killing them. As this plot was, however, attributed to the Lollards, some of whom were taken and executed, and rewards offered for Sir John Oldcastle, Lord Cobham, imputing thereby the attempts to him, the account must be taken with considerable allowance. Even in the midst of the horrors of war Henry did not forget the Christian mercies of this tide; for during the siege of Rouen in his sixth year, and that city being in great extremity from hunger, he ceased hostilities on Christmas Day, and gave food to all his famishing enemies who would accept of it. Something like this occurred, in 1428, at the siege of Orleans, “where the solemnities and festivities of Christmas gave a short interval of repose: the English lords requested of the French commanders, that they might have a night of minstrelsy with trumpets and clarions. They borrowed these musicians and instruments from the French, and Dunois and Suffolk also exchanged gifts.3 In his eighth year, Henry, with his queen, the "most fair" Katherine, sojourned at Paris during the feast, and “kept such solemn estate, so plentiful a house; so princely pastime, and gave so many gifts, that from all parts of France, noblemen and others resorted to his palace, to see his estate, and do him honour.” This was a stroke of policy to ingratiate himself with the French, and the French king at the same time kept his Christmas quietly. Henry the Sixth, for the first few years of his troubled reign, was a mere child; though, in the tenth year of his reign, and the same of his age, having just previously received the homage of the French and Norman nobles at Paris, he celebrated the Feast with great solemnity at Rouen; a place where, not long after, some of those in high places of our country were to disgrace themselves by the cruel punishment of Joan of Arc. He seems afterwards to have kept his Christmas in the usual manner, until the disastrous wars of York and Lancaster, during which the fate of the monarch, — and, indeed, who, for the time being, was such monarch — depended on the predominance of the white or red rose. Plays and interludes, with disguisings and mummings, were of very ancient date, and derived, like many other things, from the heathens. As early as 108 stage plays and spectacles were forbidden by the Concilium Africanum, on the Lord’s day, and other solemn Christian festivals, and by several subsequent councils, whose orders seem to have been but little attended to, showing how deep-rooted was the attachment to these shows. The early secular plays, principally performed by strolling minstrels, were frequently of a comic nature, but of a gross character, and accompanied by music, dancing, and mimicry. About the twelfth century the ecclesiastics introduced miracle-plays and scripture-histories, to counteract the secular plays, and these became common in the time of Henry the Second; the miracle-play of St. Katherine was acted at Dunstaple early in the twelfth century.9 London became famous for them, and in some places different trade-guilds produced each their separate play or mystery, as we find in the case of the Chester and Coventry Mysteries, and others, It was found expedient in these to introduce some comic passages, to relieve the length of the performances, and attract the notice of the audience, who probably paid on the voluntary system, as each thought proper. Thus, in the ‘Chester Mysteries,’ about the fourteenth century, Noah’s wife refuses to go into the ark, without her gossips, every one, and swears by Christ and by Saint John; and when she is at last forced in, she salutes Noah with a hearty box on the ear. In the Cornish Mystery of the ‘Creation of the World,’ by Jordan, which is, however, nearly three centuries later in date, the lady is much more civil, and is very careful to collect her property, like a thrifty housewife, because “they cost store of money.” In the ‘Secunda Pastorum’ of the Towneley Mysteries, which are said to be about a century later than those of Chester, Mak, the buffoon of the piece, steals a sheep from the Shepherds, while they are asleep, and takes it home to his wife, who puts it into the cradle, endeavouring to make it pass for a child, and praying that if ever she beguiled the Shepherds, who have come in search of it, she may eat the child lying there. The trick, however, is discovered, one of the Shepherds, going to kiss the child, finds the long snout. A similar story is told of Archie Armstrong, the jester, in the seventeenth century, excepting that his fraud was not discovered. In the ‘Slaughter of the Innocents,’ a cowardly character, called Watkyn, requests Herod to knight him, that he may be properly qualified to assist; he is nevertheless well beaten by the women, and goes to complain accordingly. These Mysteries abound in anachronisms: Pharaoh in his pursuit of the Israelites, when in fear of drowning, recommends his people to lift up their hearts to Mahownde, or Mahomet; Herod constantly swears by him, sometimes even calling him St. Mahomed, as the Sicilian peasants swear by Santu Diavolu, and promises to make one of his counsellors Pope, by way of reward; Noah’s wife swears by Mary; Caiaphas sings mass and the Shepherds are acquainted with the fools of Gotham; but as individuals of this class are of a very ancient, as well as lasting, breed, the statement may be correct, if applied to some Gotham in Palestine. In the 'Mactatio Abel,' of the same collection, Cain is made to speak in the rudest dialect of West York, using the vulgarest phrases, with gross buffoonery. with the King of Egypt, and fair Sabra, his daughter, still extant in some parts of the country, may have the same origin. It is evidently of great antiquity; and the fact of its being performed in similar manner in the extreme northern and western parts of the country, a considerable part indeed being nearly identical, tends to prove this. “St. George!” was the old battle cry of the English, or “Sand Jors!“ as an old German poem, of the fourteenth century, on the battle of Poictiers, calls it. After the introduction of miracle-plays and mysteries, if there was a deficiency at any time of ecclesiastical performers, the clergy took secular players to assist them; and besides the fraternities and guilds, as before mentioned, some of the public schools also claimed an exclusive privilege of performing plays at particular times and places; the scholar of Paul’s School, indeed, applied to Richard the Second to prohibit inexperienced persons from presenting the ‘History of the Old Testament,’ which the clergy had been at great expense to represent publicly at Christmas. The parish-clerks were also famed for their representations, which seem frequently to have taken place at Clerkenwell, and occasionally lasted for several days. One is mentioned by Stow, in 1409, at Skinner’s Well, near Clerkenwell, which lasted eight days, commencing from the Creation of the World; which was indeed the favourite beginning, if we may judge from the sets of mysteries still extant; the authors thinking that date sufficiently remote: unlike some pedigree hunters, who some say down their ornamented tree, place a note, stating that about this time the world began; or the Chinese picture of the Creation, which has, in a corner, a Chinese mandarin looking on through a telescope. About the middle of the fifteenth century, moralities, or morals, appear to have been introduced, consisting of allegorical personifications, and with them the Vice with his dagger of lath and fool’s coat. The scripture-plays were not, however, immediately abandoned, and may be met with, though perhaps in the shape of a puppet-show, as late certainly as the time of Queen Anne, when at Heatley’s Booth, at Bartholomew Fair, might be seen the old Creation of the World, newly revived, commencing with the Creation of Adam and Eve, and finishing with rich Dives in Hell, and Lazarus in Abraham’s bosom.11 The French had representations similar to those of the English, at least as early in date; and, in 1313, Philippe-le-Bel exhibited, on the occasion of conferring knighthood on his children, the following spectacles: — ‘Adam et Eve;’ ‘Les Trois Rois;’ ‘Le Meurte des Innocens; N. S. riant avec Sa Mère, et mangeant des pommes;12 Hérode et Caiphe en mitre, &c. In France, and in Spain, where they had their Autos Sacramentales, as they called these mysteries, from an equally early date, these performances have been continued to modern times among the country people, and most of their collections of carols contain two or three short mysteries. The plays exhibited at court, during the Christmas, were probably different from those of the clergy, and more in the nature of mummeries, or disguisings, with pageants, until the time of Queen Elizabeth, when the regular drama was performed before her, a practice which has been renewed in the elegant Christmas festivities of our present Queen. After Edward the Fourth became the, undisputed king of this country, he resumed the custom of keeping Christmas with pomp, wearing his crown, and keeping his estate, and making presents to his household; but the parliament nevertheless, in 1465, thought it necessary to pass one of those useless acts against excess in dress, forbidding cloth of gold, and shoes with pikes more than two inches long, to any under a lord. In 1461, also, all diceing, or playing at cards, was prohibited except at Christmas. Cards forming then, as since, an essential part, in many places, of the Christmas amusements. Among the Christmas gifts, during this reign, several were given to players and minstrels. Margery Paston, in a letter to her husband John Fasten, 24th Dec., 1484, says that his eldest son had gone to Lady Morley to know how the Christmas next after her husband’s death was kept, and that there were no disguisings, nor harping, nor loving, nor singing, nor loud disports; but playing at the tables, and chess, and cards. Richard the Third’s reign was too short and turbulent to give much opportunity for festivities, but he nevertheless kept two or three Christmasses in state, and particularly in 1484, at Westminster, when he wore his crown at a royal banquet on the Epiphany, clad in rich attire, of which he was fond and it was observed that the princess Elizabeth was dressed in splendid robes of the same form and colour as those of the queen, whence inferences were drawn that he wished to get rid of the queen, either by death or divorce. Yet even now we hardly know the real character of Richard, and whether there were not some lights to relieve the dark shade: ambitious he was, and unscrupulous, but eloquent, and brave or bold; and perhaps, after all, his hump was only a high-shoulder. The old Countess of Desmond, who danced with him in her youth, describes him as a handsome man, somewhat dazzled probably by dancing with royalty. Shakespeare has rather treated him like a mad dog, and given him a bad name. With Henry the Seventh commenced that series of splendid Christmasses which lasted, with little interruption, until the time of the civil wars, and were especially magnificent in the first half of the reign of Henry the Eighth, and of which historians have left us such particulars, that we can fancy ourselves present at them. In Christmas, 1489, however, the measles were prevalent, and proved fatal to several ladies and gentlewomen, and there were no disguisings, and but few plays, though there was an abbot of Misrule, who “made much sport and did right well his office;” the ambassadors of Spain dined at the king’s board on Twelfth Day, and the officers of arms had their largess, as they were accustomed. In the following year, to make up for it, there was a goodly disguising on New Year’s Night, and many plays during the Christmas. There are some household books of this king still extant at the Chapter-House, which contain many particulars of the payments for the Christmas diversions. Among these there are numerous gifts to different sets of players; dramatic performances, such as they were, being frequent in this reign; but the payments are somewhat of the smallest, varying from. ten shillings to £2. 13s. 4d. for each set of players, excepting on occasions when some of the gentlemen of his chapel played before him, who received as much as £6. 13s. 4d. for their services, which sum appears also to have been the usual reward for the lord of Misrule. It is probable, however, that the players had rewards from other people besides the king, and that when the cap was handed round a handsome collection was frequently made. On one occasion no less than £12. was given to a little maiden that danced: now, considering how careful Henry was of his money, and comparing her reward to that of the players, we must presume her to have been the Taglioni of her day. The payments by the nobles were frequently small; in Lord Howard’s account there is one of 3s. 4d. to four players. Besides the plays, there were disguisings and banquets; and Walter Alwyn and Jakes Haute had, at different Christmasses, each £20 and upwards, for the disguisings or revels. In 1493, on Twelfth Night, there was a great banquet and wassail, and a pageant of Saint George with a castle; and twelve lords, knights, and esquires, with twelve ladies, danced after the wassail.13 Henry the Eighth at this time was but a fat-checked child, so could scarcely reckon his taste for this sort of amusement — in which he afterwards so much delighted — from so early a date, but had plenty of opportunities subsequently of maturing it. On Twelfth Day the king made the accustomed offerings of gold, myrrh, and frankincense: the dean of the chapel sent to the Archbishop of Canterbury the offering by a clerk or priest, who was to have the next benefice in the gift of the archbishop. The king was to wear his crown and his royal robes, kirtle, surcoat, furred hood, and mantle, with long train, and his sword before him; his armills of gold set with rich stones on his arms, and his sceptre in his right hand. Wassayle, wassayle that never wylle fayle." The days generally chosen for the wassail bowl were Christmas Eve, New Year’s Eve or Twelfth Night, which in some places was called Wassail eve. Machyn, in his Diary, mentions his being at supper at Mrs. Lentall’s, at Henley-on-Thames, on Twelfth Eve, 1556, when there came in “xij wessells with maydens syngyng with their wessells, and after cam the cheyff wyffes syngyng with their wessells; and the gentyll-woman had hordenyd a grett tabull of bankett, dyssys of spyssys and frut, as marmelad, gynbred, gele, comfett, suger plat, and dyver odur.” Master Machyn is somewhat arbitrary in his spelling, even allowing for the eccentricities in this art at the time in which he wrote. The custom is still partially extant. Many great houses had, and no doubt still have, wassail bowls of massive silver. Wassail, in Ben Jonson’s mask of Christmas [Christmas, His Masque], is described as a neat sempster and songster; her page bearing a brown bowl, dressed with ribbons and rosemary, before her. There are several old wassail songs still existing, as well as some that bear a more modern stamp. In Devonshire, and elsewhere, it is an old custom to wassail the apple and pear trees, by pouring out a libation at the foot, in order that they may bear the better. From what we read of the character of Henry the Seventh, we cannot fancy him entering into these amusements with unrestrained hilarity, but to have treated them as part of the state ceremonies, counting the necessary cost with reluctance. All the forms to be adopted for each day were laid down in exact manner, and no doubt the time and quantity of smiles and laughter were properly regulated. Even his jokes were somewhat of a severe practical kind; he once asked an astrologer if he knew where he, the astrologer, should pass his Christmas, and on his professing his ignorance, told him that he was then the most skilled of the two, as he knew the astrologer would pass it in the Tower, and sent him there accordingly, and then we may suppose ate his Christmas dinner with much self-satisfaction. The custom of giving Christmas - boxes and New Year’s Gifts, seems now to have been organised into a regular system; there was a graduated scale for giving and receiving, according to the rank of the parties, and the amount was as well ascertained as the quiddam honorarium to a barrister or a physician. At New Year's Day in the morning, an usher of the chamber came to the door of the king’s chamber, and said, “There is a New Year’s Gift come from the queen,” to which the king answered, “Sir, let it come in;” the usher with the gift was, then admitted, and afterwards the ushers with gifts from the nobles, according to their rank, and these, messengers had rewards given them, from ten marks to the queen’s messenger, if a knight, down to forty shillings to an earl and countess’s servant. The queen received gifts in the same manner, though of less value. The king was on this day to wear his kirtle, his surcoat, and his pane of arms, with his hat of estate, and his sword borne before him.20 No doubt an accurate list was kept of those expected to give their New Year’s Gifts, and as their messengers arrived they were marked off; or, if they failed in their duty, were looked on with suspicion and ill will. In one year he gave away as much as £120 in New Year’s Gifts, but this was probably in return for presents of much larger amount, or in reward to those bringing gifts; the whole must have been a sadly formal proceeding, and more to the glorification of man than any other purpose. On Christmas Day and the other feast days, the queen made her offerings, amounting generally to five shillings in each case, and also gave away money in alms, charges being made for sixty shillings for this purpose on New Year’s Eve. She also gave numerous sums at Christmas, in gifts as, to the grooms and pages of the household £20; to the lord of Misrule 20s. ; to my lord privy seal’s fool 3s. 4d. Cards were much used, as in former times, and sums of a hundred shillings are charged for the queen’s “disporte at cardes.” The lord, or abbot, of Misrule, as he was indiscriminately called, was now an important officer, and an essential accompaniment to the Christmas revels; payments are frequently made to him, generally of ten marks or £6. 13s. 4d. under these or some other similar names this personage existed from very early times, not only at court, but in the houses of the nobility, of the lord-mayor and sheriffs, in the Inns of Court, and at the different colleges; he is even mentioned in the original draft of statutes, of Trinity College, Cambridge, in 1546, soon after which time he appears to have reached the summit of his magnificence. Many of the nobility kept the feast with great splendour, and probably during the time of Henry the Seventh, exceeded even the court in this respect. They bad their own players, minstrels, and waits, and officers of their household, in imitation of the royal establishment; having among their retainers many gentlemen and frequently some knights. Edward Stafford, duke of Buckingham, gave some princely entertainments during this reign; on the Epiphany, 1508, he had 459, to dinner, of different degrees, including 134 gentry, with two minstrels, six trumpets, four waits, and four players. The supply of provisions was fully commensurate with the demand, but it would not afford much interest to give it in detail; as unusual dishes now, may be mentioned a salt sturgeon, three swans, two peacocks, two herons, four dog fish, and half a fresh conger; oysters were probably scarce, as only 200 have mentioned, valued at 4d. ; the wines were Gascony, Malvoisy, Rhenish, and Ossey, besides 259 flaggons (gallons) and one quart of ale; there were also two gallons of furmity, a dish which has continued in use to the present time. 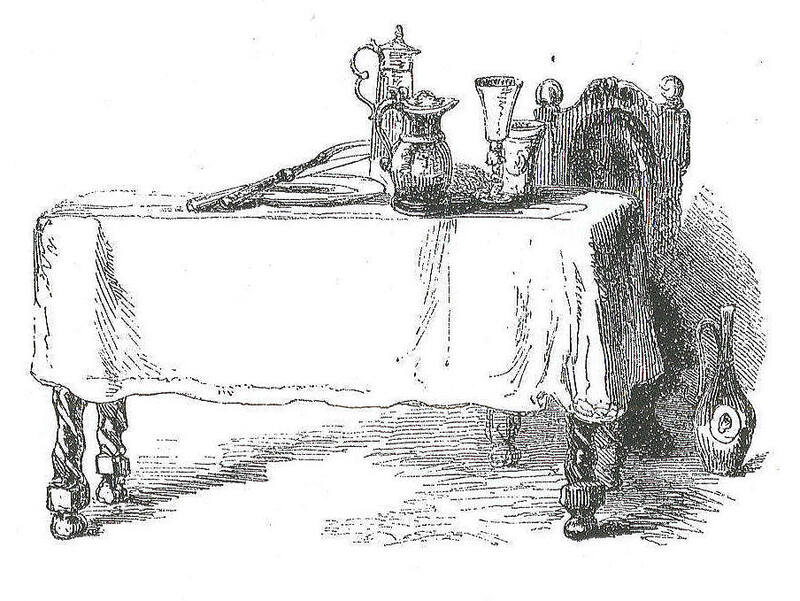 On the previous Christmas Day, the guests being fewer in number, the consumption of ale was only 171 flaggons and one quart, of which seventeen flaggons and three quarts were for breakfast;21 but this was not far from the time when the maids of honour had a chet loaf, a manchet, a gallon of ale, and a chine of beef for breakfast. In the Northumberland Household Book, five are directed for Christmas Day, three for New Year’s Day, and four for Twelfth Day. Except in the state of a cygnet, and that rarely, the bird now is not met with at table. The humbler classes of society also had their rejoicings at this tide, and were allowed certain privileges and facilities for the purpose, the restrictions under which artificers, labourers, and servants were placed as to not playing at cards and certain other games being suspended during Christmas, when there was, among other sports, playing at cards for counters, nails, and points, in every house; but, as Stow says, more for pastime than for gain. The holidays, according to this annalist, extended from All Hallows Evening to the day after Candlemas Day, and there was a penalty attached to any householder allowing such games, except during this time. 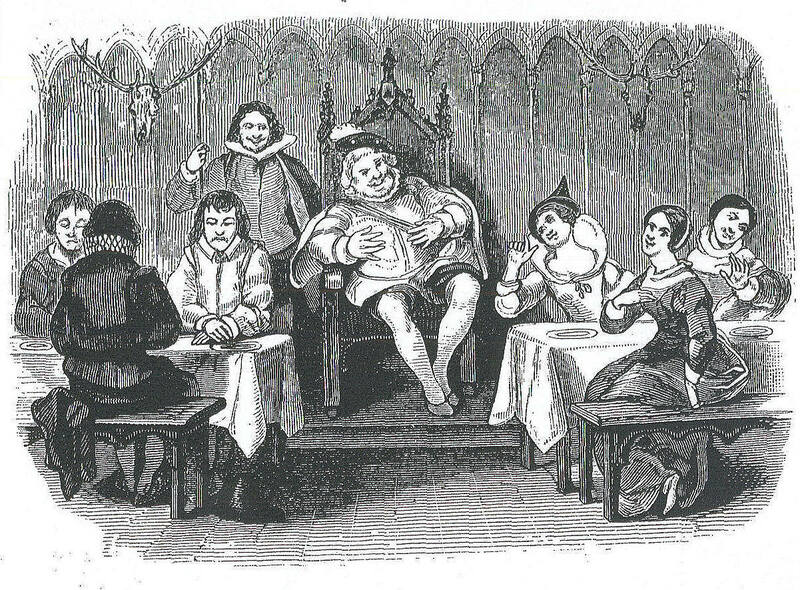 Dramatic performances were exhibited at the houses of the great and wealthy, where the tenants and peasantry were allowed access, and cheered with good Christmas hospitality; carol singing was encouraged, and it is not improbable that some of our modern carols may be connected with this age, though somewhat modified.